Today was a movie day for me, and I was struck by the contrast between watching a movie in the theater and in my own home. I love movies as a medium. I’m able to immerse myself in a different life or story. It’s one of my favorite forms of entertainment. Going to the theater is a fun experience. I thoroughly enjoy the stadium, reserved seating available now. With a large screen and surround sound, it can be a total sensory experience. I especially like having my line of sight filled with the screen for action or beautifully filmed movies. There are also times when I want a surround sound experience. Star Wars and Jurassic Park movies are must-hears that I always want to go to a theater to see. Today we saw Mission Impossible: Fallout. It was the perfect film to see in the theater because of the incredible stunts. However, there are downsides to the theater experience. My brother didn’t go to the theater for years because he hated listening to people crunching popcorn and crinkling candy wrappers. I don’t blame him. It can be annoying. I hate when people talk during the film. Reactions are fine, but conversations are very distracting. Despite these issues, I still go to the movie theater often. We also rented a movie from Redbox to watch at home tonight. We chose Red Sparrow. It was a very interesting movie, but I’m glad I watched it at home. For one thing, it was a long movie. I like being able to pause if I need something to drink or to go to the bathroom. It was also an intense movie with torture that I preferred watching on the smaller screen. It didn’t need awesome sound for the story. I don’t know about you but watching movies at either place is lots of fun! I wonder what I should watch next. One podcast that I thoroughly enjoy is Cortex. I’ve always enjoyed CGP Grey on Hello Internet (it’s very popular with cohost Brady Haran), and his YouTube videos are intelligent, informative, and entertaining. My son knew this and recommended Cortex to me. I was hooked. On Cortex, Grey is joined by Myke Hurley. Both are exceptional hosts! What I love about this podcast is how they talk about how they work. It’s fascinating. They discuss everything from the tools they use to how they set up these tools. A common topic is what’s on the screen of their iPads or iPhones. They discuss work space and ideal locations for optimal output. The benefits and downfalls of work apps for organization and calendars are explored. They also talk about division of labor and delegating to team members. I know I’m an organizational, effective work space aficionado, but I would highly recommend this podcast for anyone interested in different work styles. There are currently 72 episodes. I suggest starting at the very beginning so you can appreciate how they have evolved in developing their work. This is one podcast that always makes me smile. I hope you’ll give it a try. I’m sure you’ll enjoy listening to Myke and Grey as they navigate the complex world of work. Are You Able To Play ROBLOX With Us Today? This was the BEST text! I got it today from my granddaughter. She and my grandson were hanging out with me on Tuesday for awhile. They’re both young elementary age, and we always have lots of fun together. They had been telling me about a new game they’ve been playing on their iPads. ROBLOX: have you played it or heard of it? My granddaughter said that she and her brother are friends but they want more friends to play with. While they were at my house, they asked me if I would play and be their friend. How could I pass up an offer like that? Of course, I downloaded the app, and they taught me how to play that day. Today, for the first time, they texted me to see if I could play ROBLOX with them. YES!!! They already had a master plan. After I agreed to play, they first FaceTimed me. As my granddaughter then explained, we would start up the game and be able to see each other on FaceTime and talk while we played. How clever of them! It greatly enhanced our enjoyment as we discussed what game to play next and interacted during gameplay. At one point, we were in a gym in ROBLOX Fitness and doing different activities. As one of them would find something, they’d tell us where it was and we’d join them. We even had a snack together at a table in the Cafe. I think their favorite is Epic Mini Games. I’m really not very good at that one but they are! We also had a blast playing Natural Disaster Survival. It was interesting to play as they discussed strategy. I loved the use of technology to play together today. We had so much fun and laughed a lot. I can’t wait for the next time we can play ROBLOX again! It’s getting late, and I haven’t written today’s post. I was watching a documentary on HBO about Robin Williams and lost track of time. It was excellent, well worth my time, and I highly recommend it. There was a wealth of video and audio that was used to tell his story interspersed with interviews with friends and family. I’d been wanting to see it; I'm glad I did. However, now I’m scrambling for a topic. Usually I have a topic for my daily post that’s been rolling around in my brain. Unfortunately, that didn’t happen today! As a result, this will be much shorter than usual. In thinking about my interaction with technology today, it was just the normal stuff. I did have a frustrating moment with phones today. My husband’s car is in the shop today. He left his cell phone number for them to reach him. The mechanic and my husband were texting about some of the issues so we know he had the correct number. However, when it was time critical to get the go-ahead on ordering a part for tomorrow, the mechanic called our home number and left a message. Why not use the number he was given and that he had used earlier? Our adult children are always telling us we should get rid of our landline. This is something that probably divides generations. We both have cell phones but prefer to give our home number when filling out unimportant forms that require a number. That way most unwanted callers have the home number so we’re not bothered on our personal cells. We also have a lot of our records with businesses tied to that number. I know we need to make a change sometime soon. It would certainly alleviate the issue we had today. I’m just not sure I want to give up the phone number we’ve had for over 30 years. We are, after all, creatures of habit! Oh, well...we did get everything taken care of in time so that makes me happy. Today was a big news day! Don’t worry! I’m not going to write about the content-we’ve all probably had our fill of it today. No, I want to discuss how we get our news in the digital age and if there’s a difference by age. My phone was lit up today with news alerts! That’s how I often get breaking news. The other way I get news is through Facebook when our local channel streams news reports. I am of the generation that likes news so this is usually the beginning for me. If I’m interested in the story, I might look for longer news articles online to get more details. I also checked Twitter to see what tweets were showing up. I wanted to see how the world was reacting. I also checked to see if FiveThirtyEight Politics had an emergency podcast. They did! It was interesting as it always is. I’m probably unusual for my age group because digital news is my preferred method. I definitely am like my age group because I also watched national news on TV. I sometimes also check out CNN on TV. I still like TV news to get video and to hear experts and pundits to get a variety of views. I don’t watch it every night as my parents used to do. I watch if there’s something in particular I’m interested in seeing. There is another common way that younger generations look for news. Many like to check out Reddit (or The Reddit if you’re in the UK). I’ve tried it but it seems like such a rabbit hole. I get lost, and it takes too much effort to find what really interests me. So, I rarely check out Reddit. I think it’s good to be informed no matter which method you choose. Let me know what your preferred news delivery method is. I’d also be interested in your opinion about preferences by age group. Did you read that a mountain in Wales has been downgraded from a mountain to a hill? Did it shrink or erode? No... in fact, it hasn't changed. However, technology is behind this new determination. What did I say? Technology? How can this happen? This is the case of Fan Y Big in the Brecon Beacons National Park in south Wales. Mountains, or Hewitts in the UK, have to be at least 2,000 feet high with a minimum drop of 98.4 feet from top of the peak to the lowest point of the valley between 2 peaks. Fan Y Big is definitely tall enough to qualify at 2,351 feet high. Unfortunately, the lowest point is 5 feet shorter than the minimum required to be designated as a mountain. Surprisingly, it seems that the use of satellite technology is to blame. A mountain surveyor used this new method which collected hundreds of data points to determine the new measurement of 93.4 feet. While the park is taking this change in stride, it made me wonder about the role of technology in changing our beliefs, impacting our points of view. and dispelling myths. Throughout history, humans have had new ideas that pushed the boundaries of their beliefs. The earth was once believed to be flat, but evidence was produced to the contrary. I'm sure that this shook many people. With the advent of science and exploration, many myths and beliefs were dispelled or disproved. Now that technology is an integral part of our daily lives, is this the new method of changing our outlook and belief? I think it is! There is so much being discussed about truth in media right now. It's everywhere you look. There's also a lot of misinformation pushed to the public. Our lives are busier than ever, and information is coming at us faster and through such a variety of means. We have to be diligent in our search for what is true, and our use of technology is critical to that end. I was interested in reading about the science behind this new measurement in Wales. It is based on satellite technology like that used by GPS. I'm very familiar with GPS due to geocaching. It is a very reliable tool. As a result, I'm willing to believe that Fan Y Big no longer qualifies under the scientific test for a mountain. However, I bet that anyone who has climbed it still believes that they climbed a mountain! This new measurement cannot take away their feeling of accomplishment or the joy they felt upon reaching its peak. Just as it should be! I was with someone who was navigating a new online interface, and they couldn’t find the back button to return to a page they needed. This was a millennial who is very technological. This person then proceeded to say “I feel like an old person.” I immediately laughed and asked what that meant, and he proceeded to tell me that he couldn’t navigate and had no idea where to go. This started me thinking about how those of us who are older can become stereotyped. I think many who aren’t familiar with technology become frozen with no idea what to do when faced with this type of experience. I don’t think it’s because we’re incapable of learning how to function in our technological world. I just think our inexperience makes us fearful. I remember many years ago, when I started using computers, I was terrified I would break the computer. This was reinforced in my training classes when they told us we had to shut down the computer the “right way” so it wouldn’t break! I quickly overcame my fear, but I wonder if aging adults who haven’t used a lot of technology suffer from this fear. Fear can be a powerful deterrent. At times in my life, I know that I have been afraid to appear stupid. I’m not sure if it’s a hangover from childhood or insecurity or being an introvert, but I had to learn to overcome that fear as an adult. Obviously, I did! I had a very successful career as an educator of children and adults and spent many years as an HR Director and have been a consultant since retirement. As an older adult, I’ve reached a point in my life where I really don’t care how others view me, but I had to face my fear to get to this point. I’m not sure what the answer is, but I hope older adults can put their fears aside and embrace technology. It would help them to have someone in their lives who can encourage them to try new things and ask questions. This support person needs to be patient, to listen carefully, and to take care not to make the learner feel bad when they don’t understand. I have been lucky throughout my life to have people who did just that! As a result, I learned a lot and now have a tremendous appreciation for technology and the joy it brings to my life. I hope you have had a similar experience. Today as I was working in my kitchen, I had the misfortune of pulling a muscle in my back and having muscle spasms. Not surprisingly, I was laid up for the rest of today. My husband helped me get situated and brought food and medication as needed. The couch, ibuprofen, and ice packs were my companions. I really haven’t been able to move a lot without pain, but inactivity can be so boring. Luckily, I have technology to keep me entertained. Since I was settled in for the remainder of the day, I chose my family room as the ideal location. I had my phone, my iPad, and my Roku to help me pass the time. My iPhone kept me in touch with the world outside my home. I had a lengthy phone conversation with my younger son. I had concurrent text conversations with friends and other family members. I read posts on Facebook and kept up with Twitter. My son texted me some clips to watch, and that’s when I switched to my iPad. On my iPad, I checked out some streaming and clips on Twitch. I also watched some videos on YouTube. When I was tired of that, I played some games and completed some Color By Number pictures. Next up, I turned the TV on and switched to Roku. Roku offers so many options. I started with Netflix where I finished watching Season 2 of Greenleaf. (Can’t wait for Season 3 to start!). My husband arrived home after picking up pizza, and we moved to Hulu to watch The World of Dance. We then finished up our TV watching with the latest 20/20 about Aretha Franklin. Now I’m back on my iPad to write today’s blog. Usually I would use my laptop, but the position that feels the best for my back doesn’t work with the laptop. The iPad, however, works perfectly! I know that tomorrow I’ll be back to normal, but tonight I am thankful for all of the technology available to keep my mind occupied. It is such a different experience than when I was younger with only books, print media, and network TV to help pass the time. Isn’t technology amazing? I am truly happy to have it as a daily tool in my life. Everywhere you look there is a reminder that school is starting. On Facebook, I am seeing posts from friends and family in the South who are showing their children's first day of school. Others have children who are starting college and getting settled in their dorms. Teachers, support staff, food service workers, and bus drivers are beginning their preparation for the new year. It is a sign that summer is coming to an end and that academic challenges are ahead. Teaching has changed a lot since I began teaching almost 40 years ago. There is an emphasis on test scores and achievement data that wasn't as strong in those days. Technology and our access to data has changed significantly. Unfortunately, I don't believe that our teaching methods have changed at the same rate. While classrooms have more computers available for students, the methods of teaching remain much the same as when I was a student. I watch my grandchildren effortlessly navigate all forms of technology every day. If they have an interest in something, they can use technology to explore in-depth information about that subject. Entertainment is available on their timetable. Everything is presented in visually appealing media. How can this compete with textbooks and lectures? It can't! In order to be successful adults, our children need to know how to learn-not how to pass a test. I am hoping that education will take a good look at the needs and learning styles of students and the opportunities offered with changing technology. It is time for a change in how we deliver instruction. Students need to be encouraged to enjoy learning, to feel proud of their accomplishments, and to value knowledge; they should not feel the pressure of passing tests. I am happy to see more iPads and computers in the hands of students. Classrooms are filled with smart boards, and teachers are looking for ways to encourage and motivate their students. Let's keep these efforts moving so that technology and the joy of learning become an integral part of the daily lives of students. In a previous post, I discussed that there are so many different kinds of podcasts available that everyone should be able to find one they enjoy. In that post I mentioned a new podcast I had discovered: Everything Is Alive. After listening to the first 3 episodes, I think it's worth discussing this podcast again. Everything Is Alive is an unscripted interview show in which all the subjects are inanimate objects. In each episode, a different thing tells us its life story-and everything it says is true. I love that this is unscripted! I'm sure that the host and actor impersonating the object have had a conversation highlighting the points they want to cover. However, the improvisation during the interview is exceptional. The tone is serious and thoughtful. Sometimes it is sad; at other times it is whimsical. It is always interesting. The first one was Louis, a can of cola. "Louis is a can of generic cola. He's been on the shelf a long while, so he's had some time to think." This one was very philosophical in tone and quite sad. The second was Maeve, a lamppost. "Maeve is a lamppost. She sees all of us, but does anybody see her?" It was really interesting to explore her view of the world and how the host asks questions to help her expand her beliefs. The third, and most recent, was Dennis, a pillow. "While we are sleeping, Dennis has dreams too." A pillow's point of view is really intriguing. One thing that I also like is that the host interjects some new learning about the subject in the interview. I never realized that there are different categories of feathers until hearing from an expert in the latest podcast. This is definitely a quirky podcast, but I am really enjoying it! It's fun to examine our world from a new point of view and to learn something new. I highly recommend that you try this podcast. It will be fun to listen as it evolves. Let me know what you think! One thing that is often different in generations is the delivery method for media. It used to be a ritual on Sunday to read the paper and look at the ads. Most adults used to start their day by having a cup of coffee and reading the paper. They’d also buy magazines at the store or by subscription. That was how my parents consumed print media. It’s also the way I did for most of my life (still is for many my age), but that’s not true for me anymore! I no longer have the newspaper delivered to my house. Does that mean that I don’t read the local newspaper anymore? Of course not! I just prefer to read it digitally. At first, I read a digital copy of the newspaper with the paper layout, but I’ve gotten away from that. I get a digital version that lists articles that I choose from. I much prefer this! For one thing, I never looked at the ads when I read the paper. That was true for magazines too! I just skipped by and went to the next article. So, the digital version is concise, and I can choose what I want to learn more about and what I want to ignore. This is my preferred method for reading the newspaper nowadays. I also used to have lots of magazines delivered by mail, or I’d pick up the latest at Target or Barnes & Noble. I no longer buy magazines at all. Instead, I purchase a monthly digital magazine app that gives me access to over 200 magazines. It’s called Texture. I’ve been reading magazines this way on my iPad for several years and love it! I read a wider selection, still get beautiful color layouts just like in print, and it’s a lot cheaper than buying a lot of magazines each month. I know that many older readers still like the feel of a newspaper or magazine in their hands, but not me! I thoroughly enjoy going the digital route for my news and entertainment. Is My Internet Down...Or Is It The Server? It always amazes me how quickly we get used to something in our lives. We take it for granted until it suddenly isn’t there. I’ve certainly experienced this when my car doesn’t work. WiFi and easy access to fast Internet definitely falls into this category for me. It happened today when I was streaming something on Twitch; one minute I was connected and then it was gone! I suppose a lot of seniors may not feel this way. However, Internet is a necessity for me. When my Twitch streaming failed, I grabbed my phone to see if the site worked. It didn’t so I turned off WiFi for the real test. I could connect so I knew the Twitch server was working, and the problem was on my end! My next mission was to determine if Comcast, my Internet provider, was having problems in my area. I immediately checked out Down Detector where I discovered that Comcast had outages in my area beginning at the same time mine failed. About an hour later, Internet service was back and WiFi turned back on. Once again, I can take a moment to appreciate my ability to have information so readily at my fingertips, but I know that I will soon take it for granted again. So for now I’ll say thank you to my Internet access and enjoy being able to publish this blog! I was listening to one of my podcasts, Tea Time with Katie & Chelsea, today where the hosts were talking about how they have recommendations from friends about TV shows to watch. However, there are some that they know they will never watch. As they discussed the various shows that friends had recommended to them and why they wouldn't be watching them, I was surprised by a reference to age. One of the hosts doesn't like sitcoms very much and doesn't like shows on CBS which she referred to as "The Gray Network". I know that network TV isn't very popular with millenials to begin with. However, I was really surprised to hear that CBS has a reputation that it appeals to the senior demographic! Don't get me wrong. I wasn't offended. In fact, I don't think I watch any shows from that network either. I tend to like ABC for most of my network shows with a couple from NBC and FOX. But this comment made me question: Is CBS really geared toward older watchers? I started wondering why seniors would be attracted to CBS so I decided to look at their lineup. I was struck by the fact that the majority of shows are sitcoms or police procedurals. This seems like what I liked to watch when I was much younger. Sitcoms reigned supreme at that time, but they don't hold my interest anymore. I can see why CBS doens't appeal to me. I like the dramas that keep me guessing on ABC and the high production TV found on HBO and STARZ. Why did I never realize that I have moved on from "The Gray Network"? I believe that there should be a wide variety of TV offerings and that people should choose whatever they find interesting and enjoyable. While I really don't know if the demographics for CBS skew toward seniors, I just know that it's not for me. I find it interesting that CBS has the reputation that it does. I'm starting to wonder if there is any correlation between how technological viewers are and the choices they make when watching TV. It would be a fascinating study! For now, I'm finding that the TV selections have dried up for the summer. I am looking forward to new and returning shows in the Fall and will be analyzing target demographics for networks more than I ever have before. I just hope we all find something fun or interesting to watch. I'm also interested to hear what you think about the idea that networks have an appeal for a certain age group. If this is true, are we seeing differences in marketing and advertising? As always, it's fun to be more aware of these issues as we enter the Fall season of TV. Do you find yourself needing something to keep your hands busy with while listening to podcasts, enjoying music, or watching TV? I know many people who get on their computers, knit, scrapbook, or other activities of that type. I also know many older people who enjoy adult coloring books or jigsaw puzzles. This is probably a throwback to when we were kids since coloring books and jigsaw puzzles were a big part of our childhood. I'm certainly attracted to those types of activities; however, coloring is too slow and jigsaw puzzles take up too much room. I need activities that are easy to pick up and then set aside as needed. I have luckily found a couple of apps that meet my needs. If you like coloring, there are a lot of apps out there for you to try. Colorfy has been the app of choice when I want to choose my own colors and be creative. There are some free puzzles and colors-usually enough to satisfy my needs. I have never felt that I wanted to pay to expand my options. I love coloring on my phone or iPad because of the flexibility it offers. Large areas fill in at the touch of a finger. Don't like the color you chose? Just choose another and touch the area! It's a great way to color! If you don't want to choose your colors, you might want to try Color By Number. I just discovered this app but love it when I want to keep my hands busy but my mind available. There are lots of free pages to color plus daily offerings. My grandkids like Pixel Art where you color each pixel by number. This offers the ability to fill in areas by dragging your fingers and ways to speed up coloring. If you like to color, I would recommend that you check out these and other coloring apps. If you want to play jigsaw puzzles on your computer or tablet, check out Magic Puzzles. I've been playing this for years. It gives you the option of changing the number of pieces in the puzzle you are solving. Each month you can download free puzzles for each day of that month. By playing, you get coins which you can use to buy more puzzles. I have never spent money on puzzles but have had plenty to do when I wanted to work on one. There may be others out there, but I highly recommend this app. You may have found other apps that work as well as these. Share any suggestions in the comments. Whichever you choose to play, I hope you are having fun! It's sleepover time in our house tonight! I promised our grandkids that they could have a sleepover sometime this summer when school was out, and this is the weekend. As a mom and former elementary teacher, I know that we need to keep busy so we spent the afternoon at the Minnesota Zoo. I started wondering: does the Minnesota Zoo have an app? When I went to the app store, I discovered that they certainly do have an app. I was surprised at some of the things you can do with the app. I was expecting a map and maybe a schedule. It certainly did have those things, but there was so much more! While you can check those things, you can actually build a schedule for your visit. As you complete each activity, you check it off the list. This list even includes going to the bathroom before heading to the parking lot to go home. I thought this was a great feature. There was also a communication page with icons that talk for you. You can choose from the following: Bathroom please, I need a break, I feel happy, I am hungry, I am nervous, I like this place, I need help, I am thirsty, and I am tired. This is such a great service for children and adults who need assistance with communication. This is a very comprehensive app. There are narratives about what to expect at the zoo and about the different areas of the zoo. They call it Social Guides. It includes a section that talks about caring for the animals. I was especially impressed that they have games available if you need a break. They also have information about first aid, restrooms, wheelchair/cart/stroller rentals, food, quiet spaces, and busy times. This was really the place to go for any information you may need. We had a great time at the zoo today, and I was very happy to find some technology that enhanced our experience. It always brings me joy to discover new technology. Have you found any new tech that surprised you? Those of us who are older probably remember when the West Wing was on TV. I was a big fan. I thought it was very intelligent writing and fast-paced dialog. I used to record it and play it back since I knew I had missed some of it especially during some of the walk-and-talks. It's really odd to think about the days when I would record shows on VHS tapes to play back later. There are now so many ways to stream TV programs and watch on your timetable. For older people who want to try out podcasts, The West Wing Weekly may be the one to start with. I have been re-watching the series on Netflix every week and then listening to the corresponding episode of The West Wing Weekly. The hosts, Joshua Malina who played Will Bailey and Hrishikesh Hirway, discuss the plot points, characters, writing, etc. of each episode. They often have guests on the show-writers/contributors to the series, West Wing actors, or experts on the subject of the episode. If you are a fan of West Wing, I think you'd enjoy this podcast. Another podcast I'd recommend is the one by Mike Rowe who you may have seen on Dirty Jobs. His podcast, The Way I Heard It With Mike Rowe, is made up of short stories with a twist. Mike Rowe is a phenomenal storyteller. He has a great voice and delivery. These podcasts are usually around 10 minutes long so they are quick and easy. I'd encourage you to try it out. It's a feel-good experience. The Geek to Geek Podcast is the podcast that started it all for me! I decided to try it out, and it continues to be on my weekly must-listen list. The content is about games, movies, and books. The hosts, Beej and Void, are really good together. They are very knowledgeable about the subject matter and often make me laugh. They usually start with their week's topic followed by their weekly geekery. This is how I first learned about BlaugustReborn. They always have something new to share. I love the format of getting to the topic right away and then geeking out about what they've been up to for the week. I have discovered books to read by listening to them. The most recent was Dark Matter by Blake Crouch. It's a science fiction thriller that kept me on the edge of my seat. Once I got into it, I couldn't put it down. I also learn about gaming systems, upcoming games, and current games by listening to the podcast. While I'm not someone who plays games, I am always interested in hearing about new games and game play. That should come as no surprise since I've spent the last 25 years watching my sons play video games. In fact, I really enjoy watching game play, but I'm not quick enough to actually enjoy playing myself. This podcast keeps me up to date with gaming news. Once in a while, one of the hosts isn't available so they have their wives or kids join them to talk about their interests. Void's kids did a review of video games and gave their recommendations. His wife has been on a couple of times: once talking about her passion of knitting (really interesting!) and the other time reviewing Jurassic World which Void hadn't seen yet. Beej's wife is a skilled woodworker and shared her passion for her craft during a podcast. She also organizes fan events and shared strategies for successfully planning these events. While the dynamic changes when the hosts change, the podcasts with the substitute hosts are lots of fun! The Geek to Geek Podcast is part of the Geek to Geek Podcast Network. You may want to try some other podcasts on the network. Geektitude has lots of reviews about movies. Joe Hogan is the host and most recently talks about Comic-Con International 2018. Tea Time with Katie & Chelsea gives a female point of view. This week they're talking about the book Crazy Rich Asians which has been made into a movie. Last week was especially interesting when they had a guest and discussed LGBTQIA+ Media. RunningShoes.tv is Beej's reworking of his blog and The GeekFitness Podcast. His passion for fitness, health, and wellness is always a great motivator. I hope you try out this podcast as well as the others on the Geek to Geek Network. I'm sure you'll find something that interests you and that will make you laugh! I have become a podcast aficionado. It started because a family member has a podcast, and I wanted to support him by listening. I was hooked! This led to listening to others on his podcast network and enjoying the experience. People listen to podcasts in lots of different ways. Sometimes I listen while playing games or while I'm in the car, but my favorite thing is to listen while I'm doing things around the house. I also love some of the features on Overcast that enhance listening. There are 2 functions I use all of the time: one shortens the silences and the other allows you to play the podcast at an increased speed. Most of the time I play podcasts at normal speed, but there are times when I play them at 1.5 or 2 times normal speed. It all depends on the podcaster and what I'm listening for in the podcast. I don't think there are as many older people listening to podcasts, but I think they would really enjoy them. There is such a variety of topics available. There are great ones that discuss news, politics, history, storytelling, gaming, media, technology, and so much more. I have 14 different podcasts I listen to, and 2 are new. Clear+Vivid with Alan Alda is one of the new ones. Alan Alda is interviewing people about communication and it's really interesting. The other new one is Everything is Alive. It's a very quirky podcast that is very new. The podcast host interviews inanimate objects played by actors who don't know the questions beforehand. So far, there have been interviews with a can of cola and a lamppost. You might want to try it out! Do you listen to Podcasts? If so, what would you recommend? My husband recently injured his shoulder so he has started physical therapy. When he went to his first appointment, the physical therapist let him know that there was an app that he could use for his exercises. They then had a discussion about how she would send him the link: text or email. He requested that she text it. Once he confirmed that he had received it, she started talking about her father who is the same age we are. He just traded in his flip phone for a smart phone, and she is trying to teach him how to use it. I think that the type of phone someone older has is a prime indicator of their comfort with technology. We have always been on the cutting edge of phone technology starting with our portable "brick" we bought years ago. I've had many different cell phones including flip phones, but I have had smart phones for years! I don't know how I could function without it. I am lucky because we are all techies. When I was an HR Director, I had Human Resources Information Systems (HRIS) staff I worked closely with every day. I also led our department in implementing a new ERP system. My husband and both sons also work in technology fields so we all embrace technology as an integral part of our lives. When I think about what I can do with my iPhone, I'm amazed at how it's like the handheld computers we envisioned in early science fiction but better! I love having information at my fingertips. Often during conversations when a question comes up, I start searching for answers. Having my contact information, emails, note function, weather, news, maps, lists, music, games, podcasts, and so many other things in one central place makes life so much easier. Next time you are with someone who is older, look at their phone. I'm interested to see if the premise that this is a good indicator of someone's comfort with technology is generally true. In the meantime, I am going to have fun with my iPhone! I love discovering new apps for my iPhone! While I am always interested in new games, I especially like finding new apps that make experiences more enjoyable. When we were in Santa Fe, New Mexico this summer, we went to the Georgia O'Keefe Museum. I was pleasantly surprised to find that they had an app you could use as you went through the museum. It provided lots of information about the paintings and the artist that greatly enhanced the experience. The Minneapolis Institute of Art also has an app for this purpose. I particularly like using my own headphones as I explore the gallery! I was recently at a local baseball game for the Saint Paul Saints at their brand new stadium in St. Paul, Minnesota. As I arrived at my seat, I noticed a flyer in the drink cup advertising an app to use during ball games. Of course, I had to try it out! There was a play-by-play information feed so you knew who was at bat as well as standings in the league. There was also a schedule of future games with a link to buy tickets. These were great, but there was an even better function! There was a way to order food and drinks to be delivered to you. You entered your section and seat number, payment information, and your order. While you were sitting enjoying the game, someone arrived with your order and a tablet that told them where the order should be delivered. This was a great idea! You'd still have vendors in the aisles, but this was one-stop shopping at your fingertips. I hope that we see more apps that serve to enhance social and artistic venues. It certainly makes these experiences more enjoyable. I love finding apps in new places! I'd be interested in hearing about new places you've discovered apps that enhanced your experience. When I was young, all that was available on TV were the major networks. We would sit in front of the TV as a family My dad was the one who controlled what we watched although I was often the one who got up to change the channel. Obviously, this was before remote controls! Everything that was televised was for all audiences-what would be rated G now. While there are a wide variety of channels and offerings now, many older viewers still watch TV in the same way I did as a child: what I would call appointment television. While there are some times when I want to watch something when it first airs, that is NOT how I usually watch TV. I love my Roku!! Being able to binge TV and choose when I want to see something is incredibly freeing. I especially love not having programs interrupted by advertisers. I could never go back to only having appointment TV! I love the variety of what's available on my own timetable. I hope that more people my age and older are moving to this way of watching TV. It is so much fun! Streaming services are definitely the way to go. I love having Chromecast so I can watch YouTube and Twitch. Hulu, Netflix, and Amazon are must-haves for me. I also love having access to Premium Channels like HBO (Game of Thrones, WestWorld, Ballers, etc.) and STARZ (Outlander is THE BEST!!). I could never go back to the old way of watching TV. Technology has made it so that a wide variety of media is available on demand. I love it! Facebook For Recommending Books-Who Knew? Lately I've noticed a lot of posts circulating on Facebook about favorite books. You know how it works. For 7 days, post your favorite books and name someone to do the same. I was named by a friend recently. While I often don't participate in this sort of thing, I was intrigued by the premise since I LOVE books. So, I started trying to decide which were my favorites. It was very difficult! I found that i couldn't narrow it down to just 7, but who says I have to follow the rules? I've been continuing to post books (without naming someone after the 7th day)! It's been a lot of fun to look back at books-often series-that I have loved and to share recent books that have made an impression. I am finding it's also a lot of fun to follow up with those people I name to see what books they are listing. This is an example of one reason I enjoy Facebook! I love being able to share ideas, books, music, art, and everyday activities with friends both near and far. I have rediscovered many friends from college, students from when I was teaching, cousins who live far away, and also made new friends. I have found Facebook to bridge age groups although there are many in my age group and older who aren't on Facebook, and there are many who are younger who never joined or have dropped their accounts-my sons are examples of that. However, I continue to enjoy using Facebook every day to stay in touch and share with others. There are a lot of different opinions about Facebook which I will be exploring in a future post, but for now I am discovering new books through my friends' posts. You might want to try it too! It's a fun way to share using technology. When I checked my email this morning, I had the usual emails from companies that I sometimes use for online purchases or receipts by email. I didn't think too much about an email from Best Buy that had a subject line: NEW: Tech for Seniors. After all, it is the time of year to see back-to-school specials. 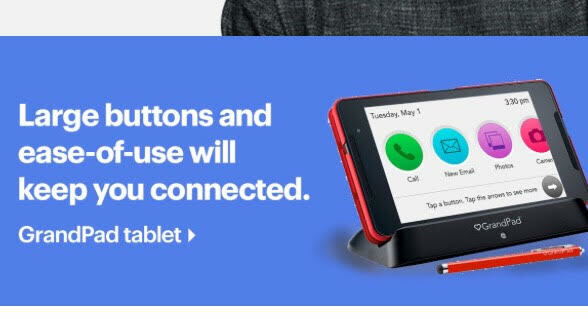 I thought that this was probably an advertisement for seniors in high school who were needing technology. Was I wrong!!! When I opened up the email, this is the picture I saw! I don't usually rant, but I immediately had a reaction to the picture of the older woman. She's attractive so they picked a good model, but it certainly wasn't the age group I was expecting. And then I read the verbiage: Feel safe, connected, and confident. I am certainly not the intended audience since I use technology constantly, but I am 65 years old and was really disturbed by these ads. For one thing, this is playing on fear by inferring that seniors have an increased need of safety. Even the model they chose was purposeful to promote this concept because this woman looks very competent. 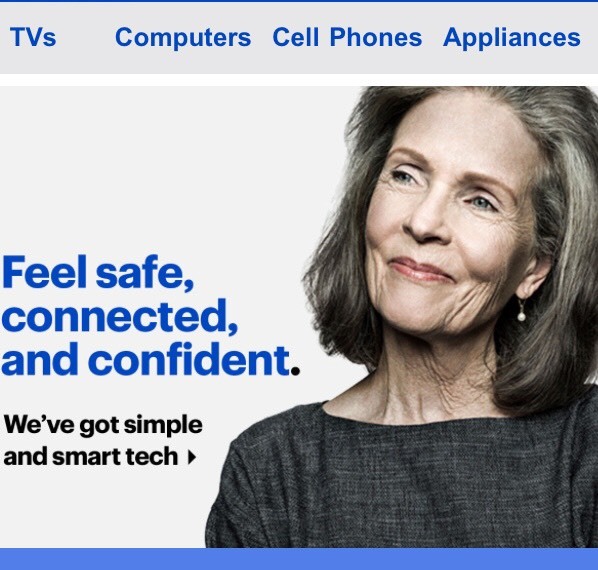 I just don't buy the premise that her fearlessness is due to the "simple and smart tech" that Best Buy hopes to sell to her! I decided to go deeper to see what products they were hoping to sell to seniors. Imagine my surprise when I found that as a senior, I am in need of medical alert devices (send the ambulance-I'm having a heart attack), special earbuds to amplify speech since I must be losing my hearing (what did you say? ), and monitoring systems so my family can keep track of me (I've fallen and I can't get up)! I must also be losing my eyesight so I need big buttons, and please keep it simple because I can no longer understand complex systems. Can you believe that this is called GrandPad? Obviously, this senior doesn't do much with technology. 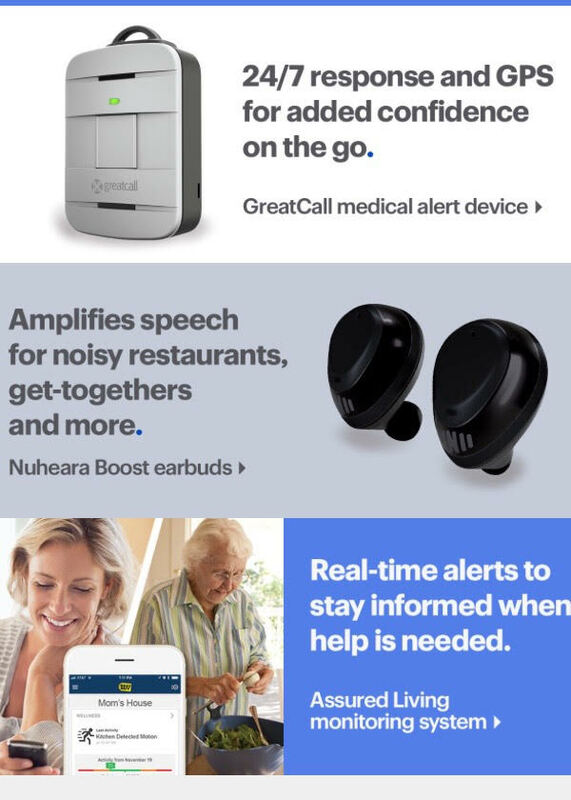 I was pretty amazed that these ads thought so little of the capabilities of seniors. Do I think these products are bad? Certainly not! There may come a time when I may need some, if not all, of these items. However, the seniors who are starting to age to the point where these are necessary are not going to be looking at these ads on their computers, laptops, tablets, smart phones, or even email anyway. And then it dawned on me: these ads are for the children of seniors!!! This is when I was really insulted! It is hard to care for aging parents. I know! I've been there. I resent this company for promoting ageism and the belief that seniors are not technologically inclined. I think it's wrong for them to incite and play on the fears of adult children who care about and for their parents. It's time for some understanding of what it's like to grow older! We should be sending the message to seniors that technology is for everyone and that there are many options available for them to choose from depending on their comfort, interests, and needs. I believe in our ability as seniors to learn new things and embrace new ideas. So, I'm hoping to see more hopeful, positive ads about new smart phones, streaming services, and computers/laptops/tablets with learning opportunities available. It would be great to see ads that offer multi-generational learning opportunities using cutting-edge technology. I choose to see possibilities not deterrents to seniors embracing and staying involved in technology, because technology is a joyful tool for staying engaged! I hope advertisers can become more forward-thinking in their quest for the senior dollar and that we all can examine any ads we see with informed eyes to reject ageism. I certainly will! If you start talking to someone about reading an ebook versus a hardcover/paperback, you will find that a spirited conversation has started. People have very strong feelings about their preferences. I rarely go anywhere without my Kindle which is my reading delivery method of choice. However, I have a great love of books and still enjoy holding a book in my hands when reading. There are certainly reasons for both delivery methods. I have favorite authors; I've been buying their books for years. Since I started with hardcover or paperbacks, I still buy those to add to my collection. I have a great affection for those authors and thoroughly enjoy holding the books, viewing the cover, examining the binding if it's hardcover, and savoring the experience. Those are the books I want to immerse myself in so I can draw it out to make it last longer while also racing to the end because it's so good. They're also books that I will read more than once so I treasure them as I add them to my library. However, my Kindle is almost an extension of me. I am a voracious, fast reader! I use my Kindle every single day, because I am always reading a book. I buy books that are reduced in price on BookBub to try new authors and love when I stumble on a new series or author. I'll read through the series before going to new material if I've fallen in love with the writing, characters, or premise. I also love the fact that I can read my Kindle in the dark. It's such a great bonus! Since reading is such an important part of what I do on a daily basis, you will probably be hearing more about books in this blog. What's it like to love learning? There's a certain joy in mastering or understanding something new. Do you remember when you were a kid and were excited to discover a new game, toy, or information about your favorite subject? You couldn't wait to explore all aspects of it: touch it, experience it, and then share it with someone. I may be an older tech lover, but that thrill of learning something new never goes away for me. I have loved learning and using technology ever since I became an adult, and I get insulted when someone assumes that I'm not tech savvy because of my age! This blog will be about an older viewpoint to technology. While I'm not a big gamer like my sons and grandchildren, I do play games and am always looking for ways to learn new technology. There is a great joy in that. So come along for my journey to find joy in technology every day!